G. B. Russo, who came to Grand Rapids from Sicily, was one of the early residents of the area around South Division and Franklin known as Little Italy when he opened his Italian grocery store on South Division. One of the earliest records of Italians in Grand Rapids is the 1880 census where seventeen are documented. Ten newly arrived sculptors from Italy, most in their mid-twenties, are noted as boarders at the Bridge St. House, which was operated by John Mohrhardt, a German immigrant. Why would ten sculptors have arrived in the city? One gave us a clue—he was a wood sculptor, in other words, a wood carver. We know that two began work at the Nelson Matter factory and another at Widdicomb’s. Italian families settled around S. Division and 5th St., which became Franklin in 1912. They were living on Ionia, Cromwell, Smith Ct., Cass, and Antoine streets. Giovanni Baptista Russo, still in his teens, arrived from Sicily in 1902. Fortunately, he had family to rely on; his uncle Augustino had been here since 1886. Russo opened his store on S. Division, in the very heart of Little Italy, around 1905. From then he was always known as G.B. Russo. Northern European immigrants, who had arrived earlier, often looked down on the Italians. Unlike the wood carvers, those from Sicily often lacked marketable skills; work was limited to laborer or peddler. Fruit peddler was a common occupation among the Italians. A few became fruit wholesalers; their produce would be sold by peddlers along the sidewalks. Like G.B. 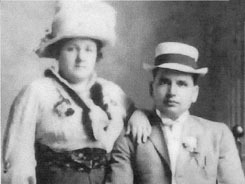 Russo, others from Little Italy eventually found success in Grand Rapids, and their descendants have contributed significantly to the city’s culture. Russo Building, View North from Franklin St.